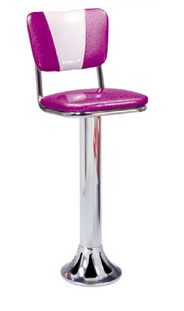 The Model B6T4V counter stool features an upholstered swivel seat with a”V” Back, chrome column, and tear drop base. Tear Drop colors come in 7 powder coated selections. Optional foot rests. Installation hardware and wrench included. This barstool may be modified for different seat pads, or middle channel in the barstool back! Let us know your desires, and we will make it happen.